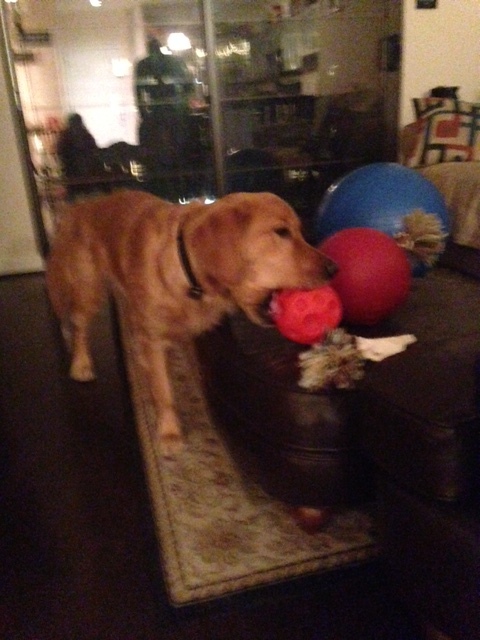 Recently, Tucker was given what we humans dream of on a daily basis: The vet ordered him to gain some more weight. While he is looking great, he needs some more “cushioning” around his hips and sides she said, so he needs to gain a few pounds. As I would dream of cupcakes and milkshakes, Tucker’s dream came true when the vet looked at the calories in his food and his activity level and told us the magical words of feeding more kibble at breakfast and dinner. This was working out until I noticed at night that Tucker was a bit more unsettled and had some tummy upsets, presumably from getting more food at night. With the vet’s advice, we’re currently trying to figure that out in different ways: either feeding more in the morning, less at night, feeding kibble with some rice at night, or other methods, such as treat puzzles that we can leave for the dog walker to give to him when we are at work to space it out some. 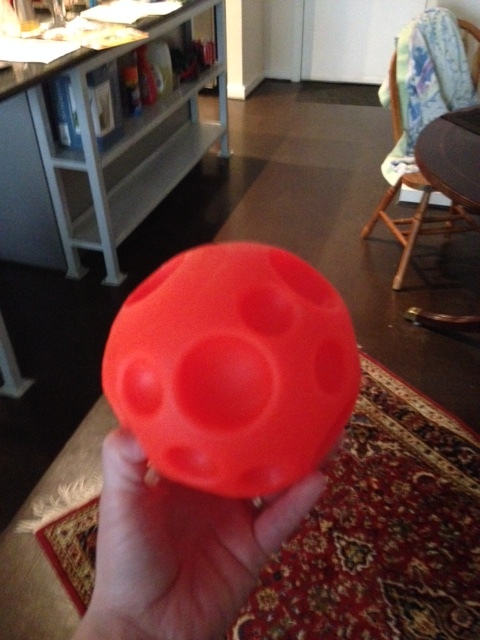 Omega Paw Tricky Treat Ball: This is a ball that has a hole which you can stick kibble down into..as your dog plays with it, it dispenses treats out of this hole. 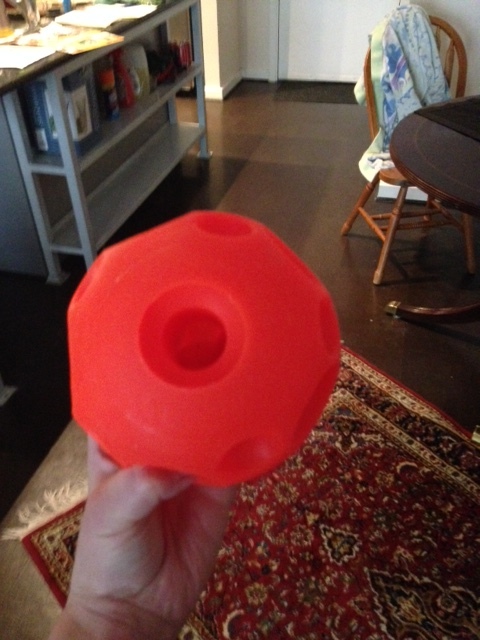 The hole isn’t super big so it challenges the dog to really play with the ball to get those kibble pieces out. 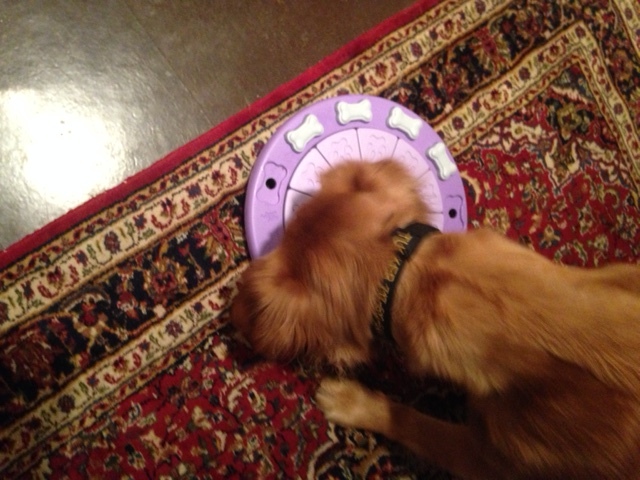 Tucker was eager to play with this, especially when he saw the kibble in it. He got a few pieces out by rolling it, but unfortunately others got stuck to each other and he got frustrated. He tried to chew the ball to make the hole bigger, but that didn’t work (YAY! point for the toy as it didn’t get destroyed in 5 minutes!). As he nosed it around, he got more kibble but we continued to have the problem of the kibble being stuck. I even had some difficulty trying to get the kibble out. In fact, I wanted to tear my hair out earlier tonight trying to get the kibble out. We bounced it, kicked it, and nothing. Maybe it was the size of the kibble but it’s definitely not easy and he lost interest fast. I’m giving this 2 paws up–I need to work with him more on it and perhaps investigate what I can put in it that still makes it challenging but also so he doesn’t lose interest because it’s too challenging. Nina Ottosson Dog Twister: I’m not sure who Nina Ottosson is, but after doing a google search of ‘challenging treat puzzles,’ her name came up and I think she might be a goddess. 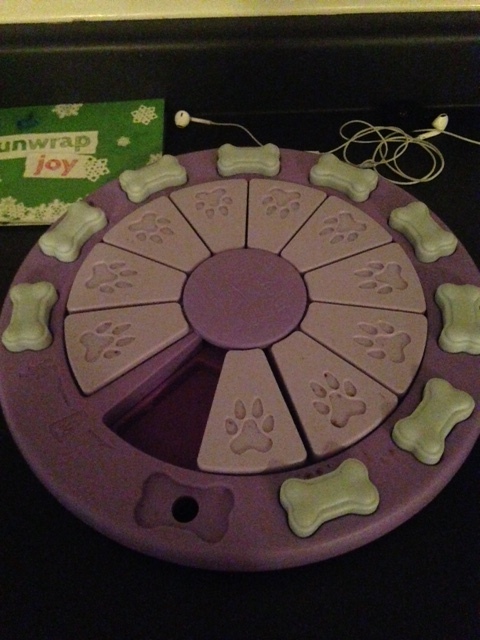 As I mentioned before, Tucker has two very easy treat puzzles. I wanted something to challenge his mind and take him a bit longer than the .25 seconds it currently takes him on the other puzzles. When I opened this one up, it came with a booklet and CD and I thought, what did I get myself into? 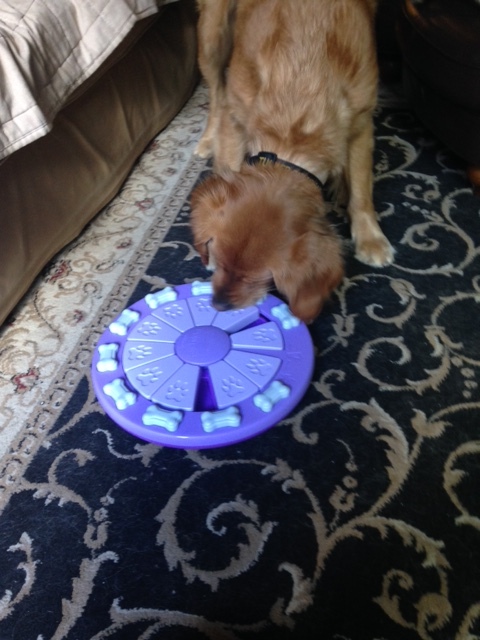 It took me 5 minutes to figure out all the various parts and how to get them out of the puzzle to put the kibble in. Basically, the dog has to look for treats by moving one block after another in a circle in different directions–if you have the bone block pegs out it’s not too challenging. If you have the bone block pegs in, the level of difficulty increases: he has to learn to unplug the blocks by lifting the pegs one by one in order to be able to move the other blocks and then find the treats. Tucker LOVES this game. We’ve tried it both ways, and he is challenged by both. The only issue I have is that I’m not comfortable leaving him alone with it or even playing with it when I’m in the room but distracted. It needs my full attention as the bone block pegs basically have to be removed by the dog’s mouth (maybe there’s another way with their paws, but Tucker likes to take them out via his mouth). I’m nervous he will chew on the bone pegs or accidentally swallow one. This one will also require some more work for him to understand it and it’s a little pricy but worth it. I’m giving this 3.5 paws. It’s kind of fun fattening up a dog! It’s hard to imagine now, but Kilroy was getting 7 cups of food per day, along with yogurt and cod fish liver oil, to get some more meat on him! Wow! They want us to give him 4 cups…we’re gradually working back up to that. I’m glad I have to fatten and not de-fatten!